Always planted or of garden origin, and never truly naturalised. 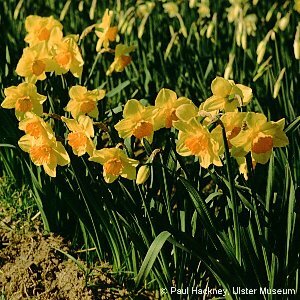 A wide variety of daffodil cultivars have been planted in “wild” situations alongside roads in many places over the past twenty years. In addition there are plants which occur in waste ground or on rubbish dumps which are the results of bulbs being thrown out with garden rubbish. Daffodils and other Narcissus spp. and varieties also persist in old gardens, long abandoned, for many years. All names: Narcissus pseudonarcissus L.